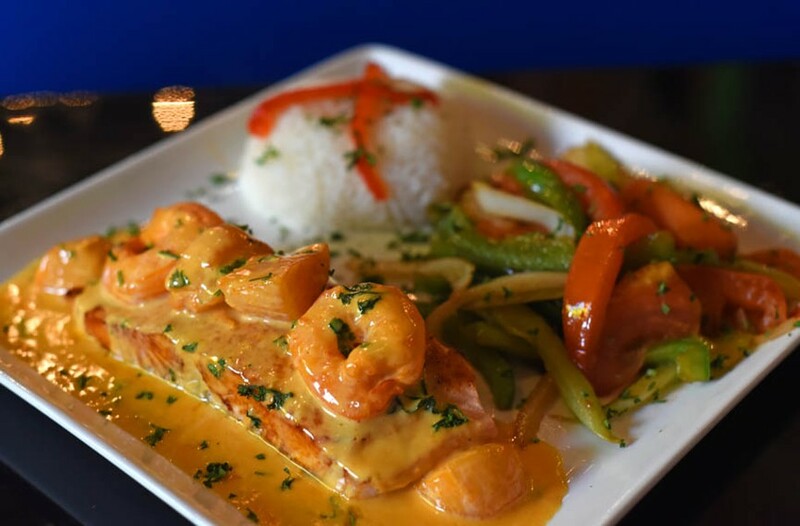 Food Review: Alero Mexican Restaurant Brings Familiar Options to the Table | Food and Drink | Style Weekly - Richmond, VA local news, arts, and events. Scott Elmquist Seasoned shrimp and scallops top the salmon Mexicano at Alero Mexican Restaurant. Along with their share of potholes and parking constraints, neighborhood Chinese and Mexican restaurants have become expectations of modern city living. They’re usually Americanized versions, too. That only adds to the appeal for some people, because the restaurants can provide proximity, low prices and the safety of familiarity. Sometimes you just don’t want your food to be as challenging as your day has been. Alero Mexican Restaurant is three blocks from my house, so I was ready to embrace it on convenience alone. Yes, it’s a typical Mexican restaurant — but one that went on record in acknowledging that it would serve Mexican-American fare. The space is far deeper than it looks from the street, and yet with a brick wall facing a warm, mustard-yellow one, there’s a coziness to it. Garishly colored sombreros aside, the restaurant’s walls — and even doors — pay tasteful homage to Mexican artist Frida Kahlo with large- and small-scale prints of her works, as well as quotations. Music ranges from hip-hop to nuevo Mexican, adding to the good vibes of the place. One of the first things we learn is that just because a dish is house-made doesn’t mean it’s going to wow us. When our server assures us that guacamole ($7.99) is made in-house, we bite, but our taste buds beg to differ once the petite portion shows up. It’s not bad, but it tastes no better than the grocery-store variety, which is how the salsa tastes too. That said, both are instantly recognizable flavor profiles for those seeking safe choices. Chicken fajitas ($12.99) arrive with a noisy sizzle but lack assertive flavors to follow through. Even a dash of salt would have given them a much-needed boost. The fish tacos ($12.99 flounder, $15.99 salmon) are buried under so much coleslaw with a pineapple vinaigrette that the taste of fried flounder underneath is muted almost entirely. They fail to elicit the enthusiasm needed to polish them off. Sliding in for dinner not long before a generous happy hour concludes, we begin with specially priced tacos ($1.99) of chicken and pork, which deliver on all fronts. Both varieties arrive plump with filling, the meats well-seasoned instead of drowning in accoutrements. Hewing closely to the standard Mexican playbook, sweet fried plantains ($4.99) arrive crispy brown with a sidecar of sour cream — the traditional dipping choice and a fine complement with so many other savory bites. 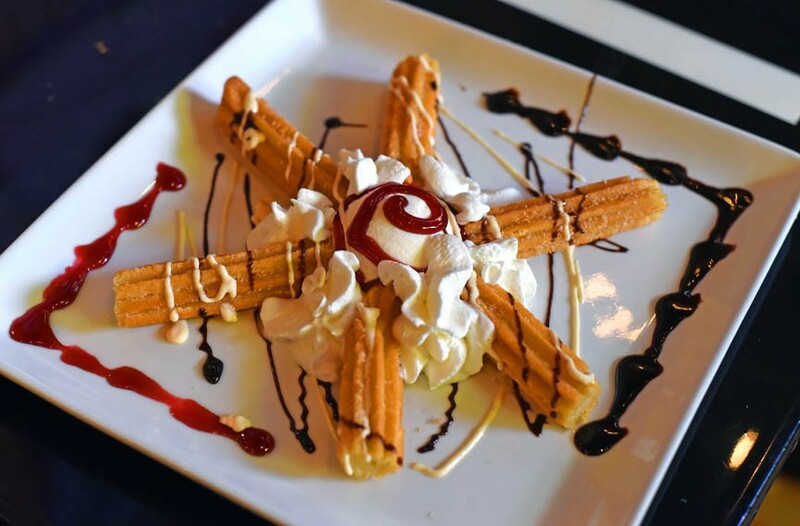 A churro for dessert at Alero Mexican Restaurant. Salads are there in numbers — half a dozen, in addition to the standard taco salad. On a sunny afternoon with the door wide open and the promise of skimpier clothing to come, we dive into the salad pool by ordering the apple-almond ($9.99) and the seafood salad ($12.99). The latter has a generous enough representation of sautéed shrimp, calamari and cut-up scallops to justify the name, while the former suffers a bit from a shortage of the two main ingredients, apples and almonds, and the desultory balsamic vinaigrette is unable to aid the cause. The kitchen nails such basic Mexican-American staples as a black bean burrito ($9.99). Enchiladas ($15.99) — one spinach and one chicken — are filling, cheese-smothered and, yes, comfortably familiar. Rounding out most plates — and ensuring you’ll never leave hungry — are Mexican rice, refried or black beans, lettuce, pico de gallo, guacamole and sour cream. The staff members seem more eager than experienced, one recommending dishes and then admitting she never actually tasted them. Rookies should be taught that enthusiasm must be tempered by knowledge, even at a neighborhood place. Alero is a puzzle. The menu lists two other locations in the nation’s capital, but as a native Washingtonian, I’d be surprised if the heavily Americanized food served here is comparable to what would be dropped off at a table in tony Dupont Circle or trendy U Street. Richmond may not be the nation’s capital, but its vibrant restaurant scene ensures that there’s a new standard in town and even neighborhood joints catering to gringos have been put on notice.